Do you have an upcoming wedding, charity event, or party that requires black tie attire? Most men don’t have a tux sitting in the back of their closets. But don’t worry! Our team at Panache Bridal & Formal have worked with men of all ages and sizes, and we’re sure that we can find a suit that fits you perfectly for your event! 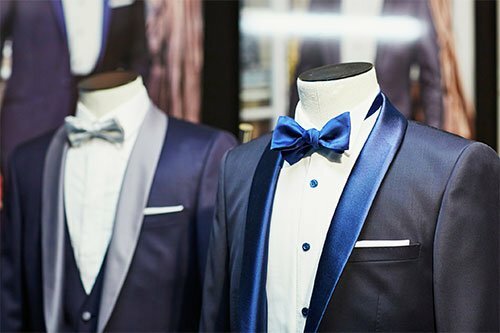 Instead of shelling out hundreds of dollars to buy a new tux that you’ll (maybe) wear once a year, why not consider a tuxedo rental? This way, if you have events to go to in the future, you can wear a new tux every time. Our selection of tuxedos ranges from classic black and gray to navy and light blue. You also have the option of choosing between a tie and a bow tie! Give us a call today to talk with our team, or stop by Panache Bridal & Formal in Houston, TX to come see the tuxedo rental options we offer!